This post contains Amazon affiliate links. If you choose to shop through these links, I will receive a small commission. Thanks! 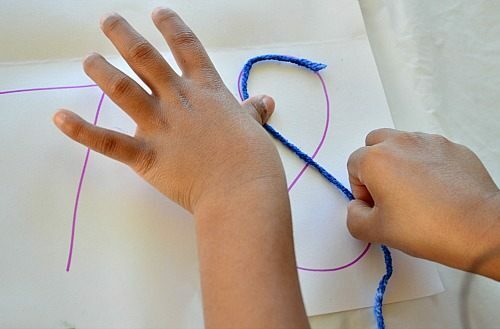 We do many fine motor activities around here which are basically embedded in the other fun activities we do. 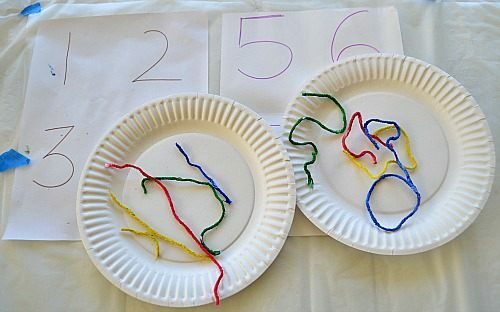 Every now and then we however like to do intentional fine motor activities – like the one we are sharing today. Another material we love is contact paper. 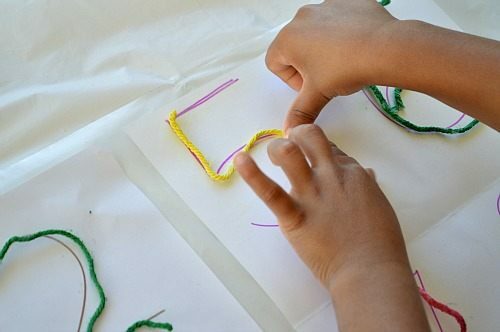 In the past we have shared a kids craft using contact paper and made glitter tubes, a toddler learning activity and another kids scavenger hunt with the same material. Contact paper is super versatile and can be used in numerous open ended art activities, kids crafts and number of learning activities. I first cut out the yarn approximately the same length as the numbers I had written down in a sheet of paper. Then I laid the sheets down and taped down clear contact paper sticky side up. Now you have your own sticky table! 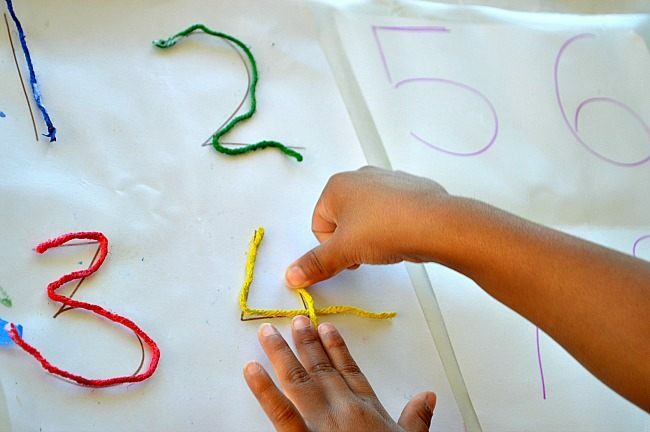 Then it was time to build some serious fine motor skills by sticking the yarn over the numbers. Since there is no glue involved, all she had to do was press down the yarn hard and the contact paper does the job! The yarn has to be aligned with the number else the yarn will either be too long or too short!.. Fun fine motor activity, right? 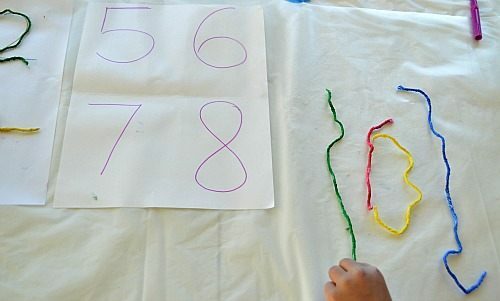 Another thing I observed in this fine motor activity is that it helps with writing the numbers in a proper way..For numbers 4 and 5 I cut the yarn into 2 parts and showed her which part comes first and which one follows..Here you can see her “sticking” the curved part first and then going for the horizontal line next. 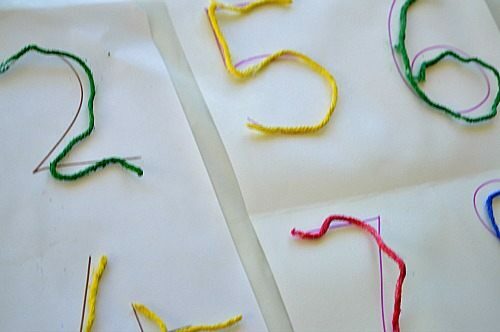 All our colorful sticky yarn numbers. We did not stop with writing numbers. I cut strings of various lengths and grouped them according to size ( you can even have the kids to do it) I had hoped for the kid to create shapes by picking out the appropriate length. My patterns loving 4 year old started creating figures with those. 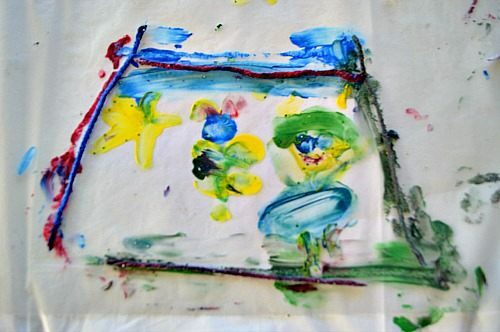 She made a triangle and then spontaneously declared “I want to make a trapezoid” and made one.Then she turned the trapezoid into a picture frame and made finger print art inside the frame. Yeah, math and art together. Just setting out the materials was more than enough and the children created their own play time. She would have continued further but some lil’ stinker woke up and wanted in.. That’s my toddler’s exploration right there.. The circle was my 4 year old’s. She was going for a yarn person. 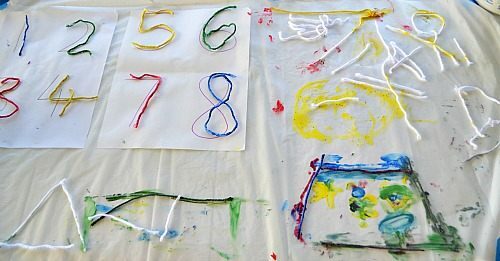 That’s the result of our creative fine motor activity – our sticky yarn table. 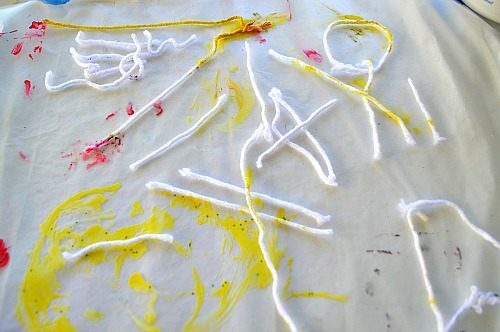 There are SO MANY things you can do with sticky table and yarn! Use colored yarn to make it more fun..Learn shapes, letters, numbers, create art work..
Now a word from our wonderful affiliates! If you want to get out of the same toy gifts rut, try this unique subscription gift that kids can enjoy for a whole year. Unique Gift Idea- Give a STEM subscription gift!!! 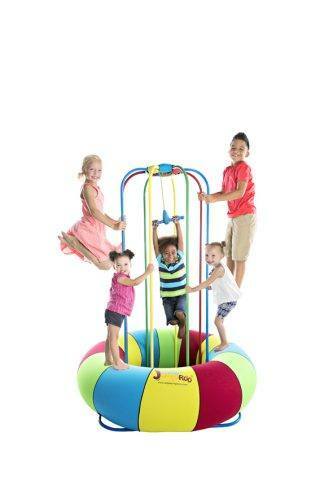 If you are going to give a toy/play thing why not make it something that will keep the kids active and away from screen. Love the extra challenge of matching the yarn with the number. Your daughter is a smart cookie! You can dip colored yarn in white wax. I use white candles melted over low temp on the oven. Then when it cools you have moldable sticky yarn and it pulls right up from any surface. We have a ton of fun with this project. 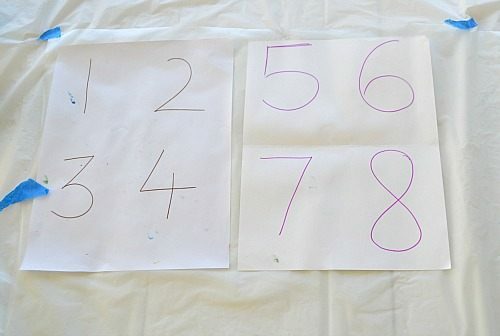 This is a great way to know how to write numbers. Looks so much fun too. Visiting from Tuesday Tots. I love sticky paper play. I’ve done this with shapes underneath but should try it again with numbers/dots to match. I think this is a great idea. I’m going to try it with my son!